This dialog is very similar to the regular Open file dialog you see in Windows. At the top, you can use the dropdown list to select a directory. In the file view, you can select one or more files (using Shift or Ctrl) you want XMPlay to open. If you only want to see a particular filetype, use the Filetype dropdown box. The Folder history dropdown box allows you to quickly navigate to a recently used folder. The lowest part of the dialog allows you to open URLs to online streams or to their playlists. Links to podcasts can be used here as well. The history of the boxes can be cleaned via the Miscellaneous page of Options and stuff. The audio tracks of a Mixed Mode CD can be played by loading the whole drive in the Open directory dialog. If you right-click the Open file or Add file buttons, you can add a whole folder at once. This dialog box allows you to select which folder you'd like to add. At the top are two checkboxes. Checking Include sub-directories will have XMPlay scan all directories within the directory you selected as well, and add all audio files it encounters. The Ignore playlists & shortcuts box prevents XMPlay from following shortcuts to other folders or files, and it keeps XMPlay from adding playlist files, which usually contain the same audio files that it already found in the folder. Both these dialogs can appear in two variants: Open and Add. When using the Open one (either for files or for a folder), XMPlay will replace the current playlist with the files you've selected. 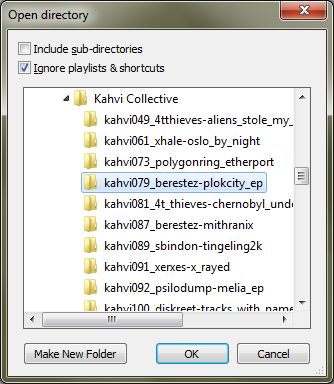 The Add variant will keep the current playlist, and add the new files to the bottom.